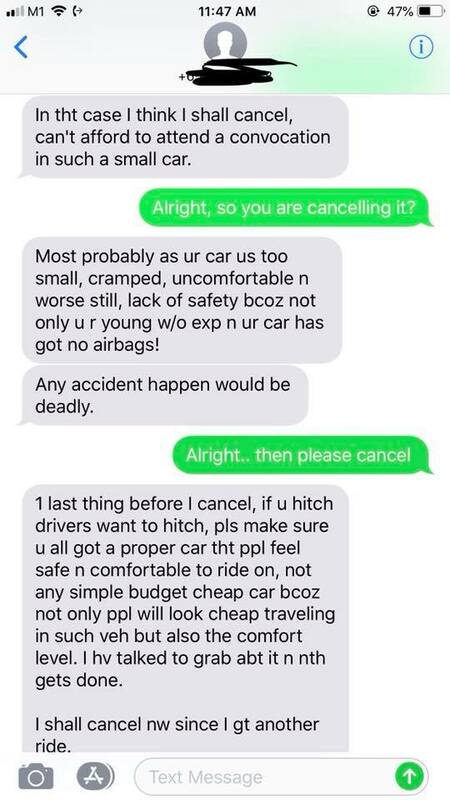 A youth tried his hand at GrabHitch for the very first time but it did not go so well, with his potential passenger cancelling the ride and giving him an unsolicited lecture. Facebook user Joel Soon, who is a Ngee Ann Polytechnic student, posted about the incident that occurred on July 30, at around 12.40pm. 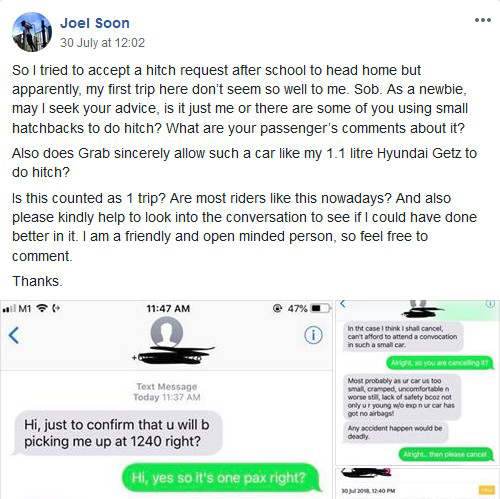 The Hyundai Getz driver wrote in public group Singapore GrabHitch Zone that he accepted the GrabHitch request while going home from school. According to screenshots, the passenger had booked a $12 ride from the National University of Singapore (NUS) to Nanyang Technological University (NTU), where he was attending a cousin's convocation. The passenger then said he wanted to cancel the GrabHitch booking as he "can't afford to attend a convocation in such a small car", adding that the Hyundai Getz is "too small, cramped, uncomfortable and worse still, lacks safety." What the passenger found more offensive than Joel's "young" age and apparent lack of experience was that his car "has got no airbags". He went on to give Joel a lecture about not driving a "simple budget cheap car" for GrabHitch because "people will look cheap travelling in such vehicles" and due to the level of comfort. In his post, Joel asked fellow GrabHitch drivers if this was the norm, if his car made the cut, and if there was anything he could have done better. Netizens sympathised with Joel and said he had done nothing wrong. Stomp has contacted Joel for comment. See the full conversation in the gallery or click here for the original post. Why make GrabHitch driver travel to your location, only to tell him you've already taken GrabCar?